The first great upsurge of interest in Muay Thai was as a battlefield skill, under King Naresuan in 1584, a time known as the Ayutthaya period. Siam was being challenged by it’s neighbours and they had to defend themselves, their families and their land. Most of these battles were at close contact and in extremely rough jungle terrain around the borders of these countries. Physical training and fighting methods were constantly modified until the Thai army created a form of hand to hand combat using combinations of fists, feet, knees, elbows and weapons that gave them a winning advantage in this jungle warfare. At this time the technique was generally called Muay Boran, not Muay Thai. During this period, every soldier trained in Muay Thai, as did the King himself. Regional forms of this fighting developed with local variations, such as; “Muay Jerng” in the North, “Muay Korat” in the North-East, “Muay Chaiya” in the South and “Muay Lopburi” from Central Thailand. 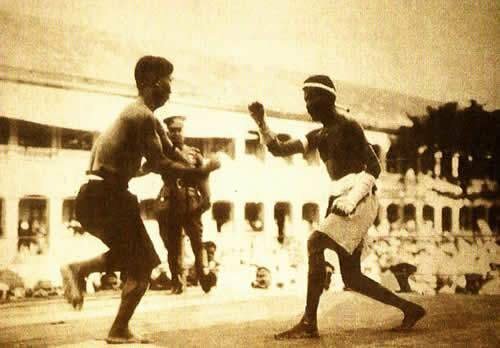 During the 1920′s-30′s King Rama VII modernized the Thai martial arts competitions, introducing referees, boxing gloves, rounds and western boxing rings. Many of the traditional Muay Boran techniques were banned or were not practical with the addition of the new rules, and so Muay Boran went into decline. Prior to the 1930’s, Muay Thai was an even more dangerous sport, with no safety gear of any kind for the fighters, and only lengths of cords to wrap around the fists in place of gloves. Over the years rules have been written along the line of international boxing regulations. It became a rite of passage for the majority of rural Thai men to take up training in Muay Thai. Over time, Muay Thai has become an important element of Thai tradition and culture. It is from these beginnings that Muay Thai has become the most popular sport in Thailand. Traces of Buddhism can be found in every aspect of Muay Thai. The most prominent is in the regalia that Muay Thai fighters wear. Below are some of the more popular pieces which make up the traditional outfit of a Muay Thai fighter. MongkhonThe Mongkhon is a traditional headpiece worn by a Thai fighter as they enter the ring and perform the Wai Khru and Ram Muay. It is placed on the head of the fighter before they make their way to the ring. Before the Mongkhon is placed on the fighter’s head, a prayer, which is believed to protect the fighter from harm during combat, is recited. It is removed from the head of the fighter after the Wai Khru and Ram Muay are performed. The Pra Jiad is another sacred piece worn by a Muay Thai fighter. Differing from the Mongkhon, the Pra Jiad is more personal to a fighter and are not usually shared throughout the gym. Often, the Pra Jiad is hand made by a member of the fighter’s family and are braided from strands of a family garment or blessed cloth from a monk. Phuang MalaiThe phuang malai is a floral arrangement given to a fighter as a token of good luck. These flowers, usually made of Jasmine, are tied together making it long enough for the fighter to wear over their neck. In Buddhist tradition, the flower symbolizes life and death and the impermanence of existence. Wai Khru and Ram MuayThe Wai Khru is the first part of the dance you see the fighter perform prior to the start of the bout. The fighter will seal the ring by walking along the inside perimeter of the ropes while stopping in each corner to say a quick prayer. The act of sealing off the ring is said to keep bad luck out and protect the fighter throughout the course of their bout. Next, the fighter goes to the centre of the ring and circles about three times. After which, the fighter will lower themselves to their knees and bow three times. Generally, in Buddhism things are done in threes as a sign of imperfection. Each time they bow they will give respect to their trainer, their spiritual beliefs, ask for luck and an honourable performance. Following the Wai Khru a fighter will begin to perform the Ram Muay. The Ram Muay does not have set routines, like the Wai Khru, and is more personal and fighter specific. At Lumpinee Stadium, musicians play traditional Thai music to accompany each match. This music is called Pi Muay, which is also the name of a traditional Thai musical instrument not unlike a clarinet. The musicians vary the tempo and volume of the music to reflect the excitement of the match in progress..
Rajadamnern StadiumRajadamnern Stadium, sometimes called, Ratchadamnoen, was the first purpose built, Muay Thai stadium in Thailand. Construction of this enormous concrete building commenced in 1941, after delays through World War II, Rajadamnern Stadium, belatedly opened to the public on December 23, 1945 as an open air stadium. Six years later, a roof was added, giving spectators and fighters welcome relief from the often extreme weather conditions. Today, Rajadamnern Stadium is still a very popular attraction for tourists and Muay Thai enthusiasts alike. Outside the stadium there are Muay Thai equipment shops, food courts, and on any given fight night you will find hundreds of motor scooters lined up outside the stadium; the property of gambling Muay Thai enthusiasts who come to the stadium, prepared to risk all on their favourite fighters. Day & Time: Monday, Wednesday and Thursday 6:30-10 pm; Sunday (2 sessions) 3-5 pm and 6:30-10 pm. The original Lumpinee Stadium opened on December 8th 1956, and closed 58 years later, on the 8th February 2014. Below are photos of the original Lumpinee Stadium on the closing night on the 8th of February 2014. The new Lumpinee Stadium has been built 20 kilometres away on Ramintra Road, close to Don Muang Airport, and holds up to 5,000 spectators in a modern, purpose built, air-conditioned stadium. Lumpinee Stadium is managed by the Royal Thai Army on behalf of the Thai Government. It has become the symbol of modern Muay Thai. Only Rajadamnern Stadium rivals the prestige of holding the title of “Muay Thai Champion of Lumpinee”. Lumpinee Stadium stages Muay Thai fighting 3 nights a week; Tuesday, Friday and Saturday. There are 3 types of seating available, the best seats are at ringside. Drinks and snacks can be purchased inside the stadium. Light meals are available, but there are no sit down restaurants on site. The fact that children as young as five and six years old begin their careers in such a violent sport has obviously been a source of controversy. Children make their way to Muay Thai gyms for a variety of reasons, regardless of why, it inevitably sparks a serious human rights debate. Muay Thai is a double sided coin in Thai society, however, with it’s long history and place within the Thai culture, even the most powerful and conservative will turn a blind eye to this issue. Chira Wichaisuthikulm, a Thai film-maker whose documentary, “Lumpinee”, explores the world and significance of Muay Thai in a group of children’s lives. “For these kids, it could mean an opportunity to change their life from a poor and uneducated background into a successful athlete and able to provide for their family”, says Chira Wichaisuthikulm. Some children come to the camps to escape a life of homelessness, drug addiction, poverty and drifting. Others commit early purely for the love of the sport. As a result, boxing camps function as large family units in which coaches often fill the roles of absent fathers and daily activities are executed communally. Currently one of the best Muay Thai fighters, Petboonchu. Muay Thai WikipediaMuay Thai in popular culture – A comprehensive list of Muay Thai in films, television and games. Muay Thai BlogsDamien Trainor – Damien is a fighter from the UK who was one of the best fighters in the world at his weight division. Muay Thai Scholar – Aaron Jahn is the guru when it comes to training and fighting in Thailand. He has a wealth of experience and shares it in his very honest and direct articles. Muay Farang – Muay Farang is a website that is run by Roberto and his son Mathias who have been living in Thailand for most of their lives. 8 Limbs – Sylvie Von Duuglas-Ittu can be a polarizing figure in the sport of Muay Thai. She has fought over 100 fights and provides incredible detail in her blog. Muay Thai Guy – Sean Fagan is the most popular Muay Thai resource online with a massive following. Sean has comprehensive listings to Muay Thai pod-casts. MuayTash – This is the personal blog of Muay Thai fighter and trainer Natasha Sky from Australia. She interviews fighters from around the world and absolutely lives for the sport. Muay Thai FightsMuay Ties – Muay Ties has up to date information and schedules of Muay Thai fights. Timo Rouge goes to Lumpinee stadium every week to film live events and post them on YouTube. Muay Thai on YouTube – A playlist of my favourite Muay Thai fights and documentaries. Muay Thai MagazinesMuay Thaimes “The Soul in the Savagery” – This magazine is dedicated to the sport of Muay Thai and covers the Muay Thai and Kick-boxing scene over in America. There are 2 main Muay Thai Stadiums in Koh Samui. The Evolution of Muay Thai.